Girls Wear Blue Too: We found a frog! Did you bring the rain little guy? 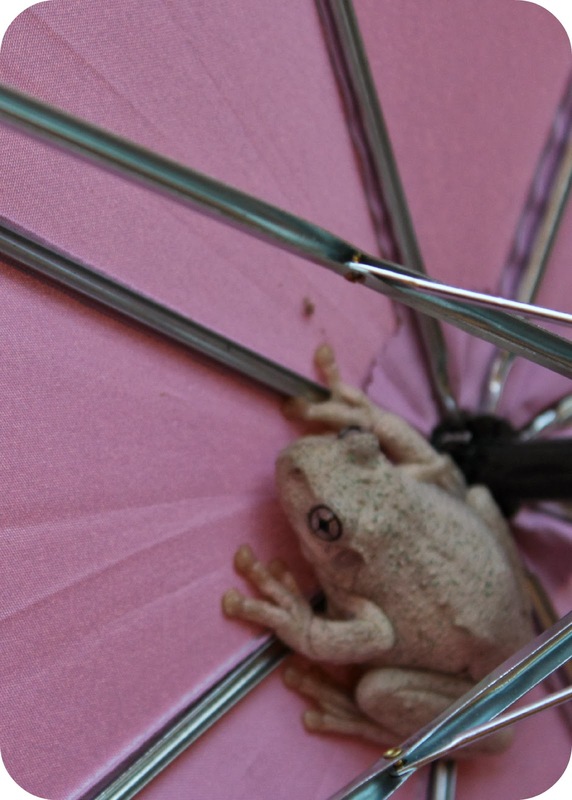 The belief that Frogs bring the rain is just one of the magical, mythical and folklore based tales that surround the frog! 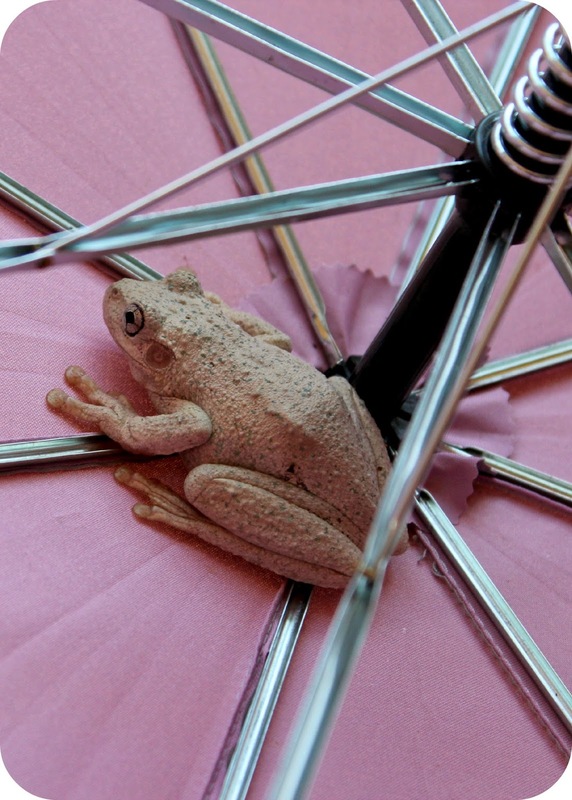 I really had no idea how many traditional ideas, superstitions and beliefs about finding a frog there were until I started to research for this post. Our little frog is a Peron's tree frog, well its not actually little, I guess he was between 5 and 10 cm long. I got quite a fright yesterday when I initially saw it, as I am sure it also did when it initially saw me! When we have been using our Umbrellas we hang them on hooks and nails about the veranda to drip dry. This practice encourages Snails to shelter about in the lovely wet dark folds and we have encountered a spider or two through this as well. Yesterday we were ready early and I decided to evict snails and pop our dry umbrellas back in the stand indoors. I shook mine out first which sent a few snails flying and as My daughters was closer to the edge I knew it was bound to have a few unwelcome residents. It is spring loaded, so without even checking I just decided to pop it open and launch any potential poachers out into the sun. I did let out a little squeal of fright when my spring loaded launching revealed this frightened froggy nestled inside. In my defence, for squealing about a lovely frog, I was prepared for huntsmen spiders, snails and potential slugs but a frog was not even on my radar as a candidate. He/she/it sat nicely while we took many photographs then we deposited it in the growth around the fish ponds hoping it could conceal itself adequately from the carnivorous birds. We couldn't see it after a minute or two so it was hiding deep down in that damp growth somewhere. The little bit of folkloric superstition I choose to take on is that finding a frog represents good luck, progress and positive transition. You can find some nice information about the different local frogs here. Much nicer than the cane toad we found in a hanging basket last week...ick!! It is very cute but what a fright for you! Yes, much nicer than a cane toad!